The author and journalist’s new book explains how antibiotics overuse helped chicken ascend from a local delicacy to an everyday protein, with serious health consequences as a result. In her 2015 TED Talk, “What Do We Do When Antibiotics Don’t Work Anymore?” journalist and author Maryn McKenna tells the story of her great uncle who died of a basic infection after a minor injury in a firehouse in 1938. Most people back then, she tells the audience, didn’t die of the lifestyle diseases we do now, but of simple injuries that led to infections. Antibiotics changed all that and yet, as McKenna details, we’re on the verge of setting back the clock on this crucial technology. Antibiotic resistance is urgent enough for the U.N. to have called a General Assembly meeting to discuss it in 2016 and for the Obama Administration to have created an action plan in 2015. It’s also common enough that many parents now think twice before using antibiotics to treat common illnesses like ear infections in children. The medicine humans directly ingest, however, is only part of the problem. As McKenna also underscores, as much as 80 percent of the antibiotics sold in the U.S. are given to animals (more than 63,000 tons per year). 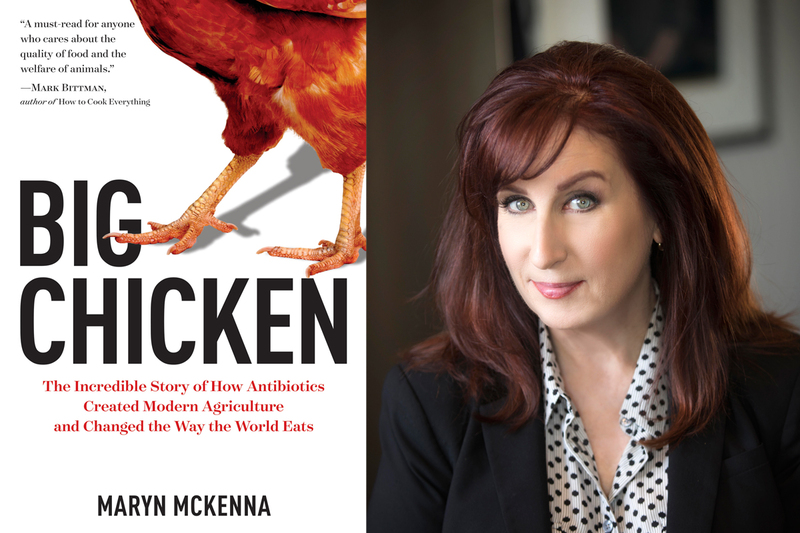 In her new book Big Chicken: The Incredible Story of How Antibiotics Created Modern Agriculture and Changed the Way the World Eats, Maryn McKenna zeroes in on how chicken in particular went from a “local delicacy to an everyday protein source.” In the process, McKenna sheds light on both the history and the future of how eat. Civil Eats spoke with McKenna recently about her book, the U.S. Food & Drug Administration (FDA) guidelines for antibiotics in farm animals, and what she’s having for dinner. Why write a book just about chicken? We eat more chicken than anything else in the United States. We eat almost twice as much chicken as beef, and we eat more chicken than pork. It’s such a part of our lives. And as I was finishing up a book on the dangers of antibiotic resistance, I came across the statistic that, in the U.S., we sell four times as many antibiotics for use in animals as we do in humans. But this made no sense to me—that medical cautions about using antibiotics conservatively could exist in the same time and space as an industry that was giving antibiotics, by the literal ton and with no veterinary oversight, to farm animals. So I wanted to know how that happened. I also realized that the story of antibiotics in agriculture was framed by and parallel to the story of chicken. Chickens were the first animals to get growth-promoter antibiotics, and chicken is probably the protein, in the United States, that is going to exit routine antibiotic use first. That was not true when I began my reporting. This book took longer than I expected in part because the story changed. Six months after I started this book, the FDA announced changes in the guidelines for how antibiotics are used in agriculture. That was when the movement toward antibiotic-free chicken really started. You write that as early as 1977, the commissioner of the FDA recommended banning growth promoters from American agriculture precisely because of the impact on humans. That didn’t happen. But, as you just explained, now the FDA does recommend—but not require—cutting the use of antibiotics. What’s your take on this voluntary encouragement? It is correct to say the guidelines are voluntary. But the reality is that the industry treated the guidelines as if they had the force of law. The industry could have fought, but they went along with it. They realized that consumers were turning away from this practice, and that maybe antibiotics don’t work the way they used to. Is that “no antibiotic” label on our chicken package enough? Ideally, where do you see this step leading us? To reduce antibiotic resistance, we should aim to reduce antibiotic use in agriculture to only treating animals that are sick, which is the way we use antibiotics in humans. I think this is the way we should use antibiotics in animals, and I have absolutely no problem with that. But we still have this very substantial category of antibiotic use that the industry calls “preventive,” meaning not curing infections but for the prevention and control of disease. That’s what tripped up antibiotic reform in Europe and I fear it’s what going to trip up antibiotic reform in the U.S.
That said, most of the companies that have relinquished antibiotic use in poultry have relinquished most preventive antibiotics as well. So, for the most part, chicken [producers have] solved this problem. The antibiotics that are still being used for preventive use in chickens, by some companies, are this category called ionophores, which don’t have any analog in human medicine. Given that producers have been amenable to changing the way they raise chickens, what’s the role of consumers? We wouldn’t be where we are now without the consumer movement. Healthcare institutions, school systems, chefs, and farms all created this groundswell that made it possible for the FDA to issue this guidance and made it safe for companies to agree. Most of these companies didn’t do what they did because they strongly believe antibiotic resistance is a worldwide peril. They changed their practices because they were afraid they were going to sell less chicken. But the consumer movement could also keep going. They could say that we really only want to see antibiotics used in animals that are sick. And they need to say it not only about poultry, which has already moved in this direction, but also about cattle and pigs, which are going to be more complicated. Because chickens are tiny and they don’t live very long. That’s exactly right. Most cows and pigs not only live longer, but they also live in several different places. So there are challenges in terms of exposure, which aren’t present in poultry. In the book, you explore an epidemic of urinary tract infections, writing that UTIs were long thought to be not only random and individual, but also often almost blamed on the young, sexually active women who most frequently get them. As epidemiologists conducted studies on college campuses, however, a strain of E. coli was discovered and eventually traced to grocery-store chicken. In other words, chicken could cause both the infection as well as its resistance to treatment. Do you think most Americans are aware of this connection? This is a story that is really underappreciated. As a journalist, I have tried. I’ve written two magazine pieces so far. In science journalism and the food movement, we think a lot about the connections between farm antibiotics and human illness. But for most people, this is a new story. Especially because even if people do think about the effects of farming practices, they tend to think about the results as foodborne illness that happens to be antibiotic-resistant. For instance, someone has contact with the meat of an animal that was given antibiotics, which directly results in an illness like Salmonella. The sense that bacteria, or the genes that the bacteria transmit, can move far away from the farm and cause illnesses that appear to have no connection to farming–that’s a step farther than most people have gone. And that’s why the UTI story is so important because it makes the case that the peril of antibiotic resistance coming from farms is bigger and more complicated than we knew. Have your own eating habits changed since writing this book? Do you eat chicken? I am a meat eater, and I want to make that very clear. I begin and end the book with me stuffing my face with chicken, and I used those two bracketing stories for two reasons. One reason is that antibiotic use in farm animals has led us down this path where protein is predictable, consistent, inexpensive, and pretty flavorless. We did not pursue flavor as a value. We pursued expediency and affordability, and I want people to think about how important flavor is. The second reason is that I wanted to make the point that it is possible to think deeply about these issues—to question how we produce protein and to work against antibiotic use—and still be okay with eating meat. I try to spend my family’s food dollars on producers that are antibiotic-free, which mostly overlaps, but is not 100 percent congruent, with [certified] organic. This is easier than it was a few years ago because antibiotic-free is not only beautiful, pasture-based farms anymore. Part of the magic of this recent turning-away from antibiotics is that it opens up the market for small and medium-sized producers. When the competition was only about price and efficiency, they couldn’t compete. But now, almost every major poultry company, with a few notable exceptions, has an antibiotic-free brand within its portfolio, and I want to see that grow. What a terrific topic. Can't wait to suggest this book to my book club! Appreciate the article. We are cattle producers who highly value flavor and health over cheap and available.